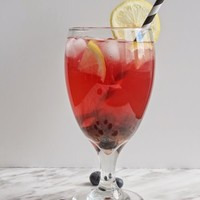 So my original bloob juice was pretty popular relative to my other recipes, and just like I created v1 on a whim iv done the same with this one, with similiar results. For this one the blueberry is much more upfront, and is accentuated by the pomegranate and the lemon. The juicy peach isnt very distinct despite the high percentage, but it alters the blueberry flavour quite nicely and rounds out the profile. For more lemon, up to 1%. Can probably sub with another lemon of your choice, just keep the % low-ish. I subbed in Cap Juicy Lemon for this. I like this a lot...much better than v1 IMO.